Hi - this is Baron. The seperate pieces are shown above. The pieces (without having to get the Citrine too) can be bought here: CITRINE CHESS PIECES. Any set of pieces can be re-engineered to work with the Citrine, but great care had to be exercised so as to get the right level of magnetization. Too great a strength of magnet meant that we wrecked a Citrine in testing by causing reed switch failure in the circuitry. We also found that reed switch 'fatigue' was more serious - it kept working for a while but then failed. We used the same unit to test that the pieces didn't influence adjacent squares and as a result we had to reduce the size (diameter) of magnet. Once having all this perfected, we took an already popular set of lux pieces and designated it for the Citrine. We could do the same with any set - but obviously the size of squares on the Citrine are a limitation. 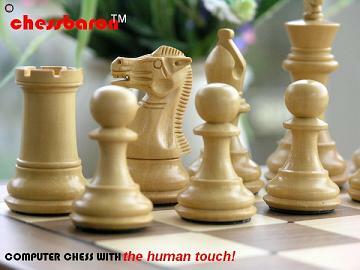 I just received( from Chess Baron) the enhanced chess pieces for the Novag citrine. They are excellent and make a huge difference in the look and feel of the game. Highly recommended.